Surely, they don’t need speech-writers? Well, they’re certainly going to need a good speech writer now judging by the polls. Davidson’s piece is just an uncritical platform for Scottish Labour to blame the SNP for something they and the Tories are responsible for, with the SNP position based on an unnamed source. Is Davidson far too professional to be affected by her income stream from Scottish Labour? In answer to your final question regarding professionalism, the answer is, “No”. It is interesting that on the BBC website yesterday the report indicated that Mr Paul Sweeney MP was supportive of Ms Joanna Cherry’s proposal. The same quote was used as in Ms Davidson’s article, but the context of the report was different. In the Scotsman piece he is being enlisted in support of the Union Jack suited MP elected by Tory voters in Morningside. In the past few days as the PM and her vanishing cabinet have lurched about with no idea other than to bring the deal back for a FOURTH vote, the media are now pushing the line that “Parliamentarians from EVERY party” are to blame for this shambles. The answer to that piece of mendacious sophistry is, “NAW! 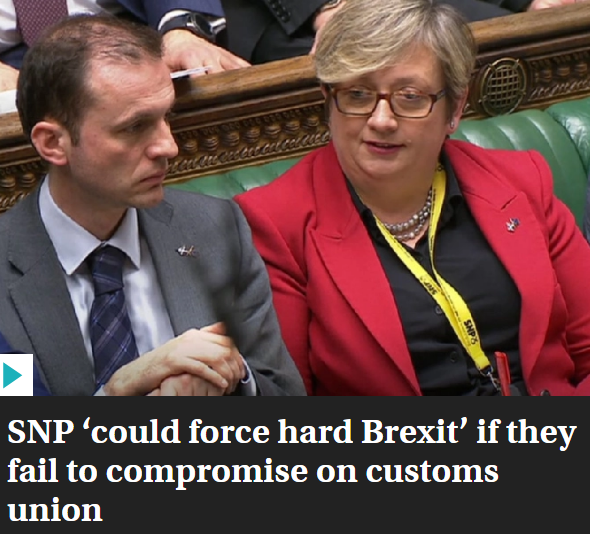 It is entirely the work of that mulish, weak and unstable PM, with some assistance from the ERG, DUP and chancers like Johnson and Gove, and some from a Labour Party, pretty badly split and seeking to hold itself together. This fiasco has shown how unsuitable the Westminster unwritten constitution is and how little moderation a Parliament elected by FPTP can exert on a Government serving the interests of a narrow elite. Only the SNP, LibDems, PC and Green can hold their heads up, along with a few principled souls on the Tory and Labour benches. What the Scotsman article demonstrates is the incorrigibly, petty minded tribalism of ?Scottish Labour. I just checked to get Mr Sweeney’s word. He described Ms Cherry’s proposal as a ‘sensible safeguard’. Not a journalist, merely a reporter (of press releases). Maybe looking for a job at BBCSweaty. I do hope they vote for Joanna Cherry’s motion to revoke Article 50 and NOTHING ELSE.